I am working in QGIS 2.18 with thermal image raster data, and I would like to isolate from the total pixels in the image those that form a group of values higher than the average of their closest environment. 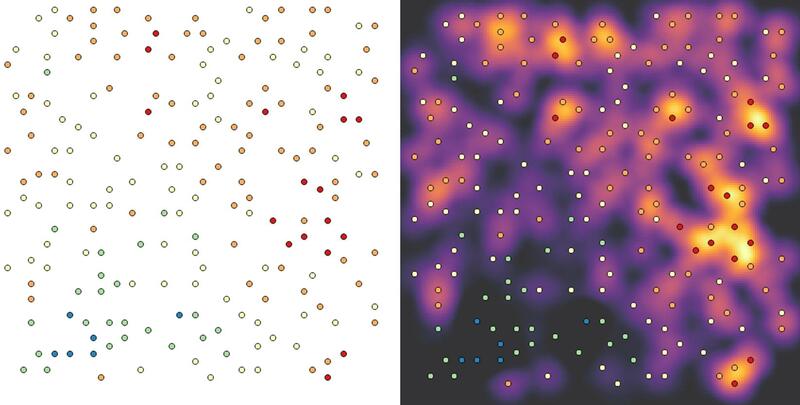 The basic idea is to identify those groups of pixels with high values, hotspots, to convert them to points. In short, use a thermal image to identify hot spots automatically. I did as @Kazuhito did but the result is not very encouraging. The idea is to find a process to identify hot spots in a mosaic of thermal images taken with an RPA. If I run the local algorithm minimun and maximun of SAGA I get many records. Would there be some way to preprocess the image to obtain better results? You may be interested in a QGIS Processing algorithm SAGA | Vector <-> raster | Local minima and maxima tool. As you are interested only in maxima, please tick off minima. (2) Left: displayed only maxima points. Right: displayed the same points as heat map. Probably this tool is rather new in processing... I used QGIS 2.18.13 with SAGA 2.3.2. Not the answer you're looking for? Browse other questions tagged qgis raster filter or ask your own question. Extracting raster values and creating new raster in QGIS? Using floating point raster image for majority filter in ArcGIS? Converting DEM to Floating Point Raster (FLT) using QGIS? How to open and display “complex type” GeoTIFF?